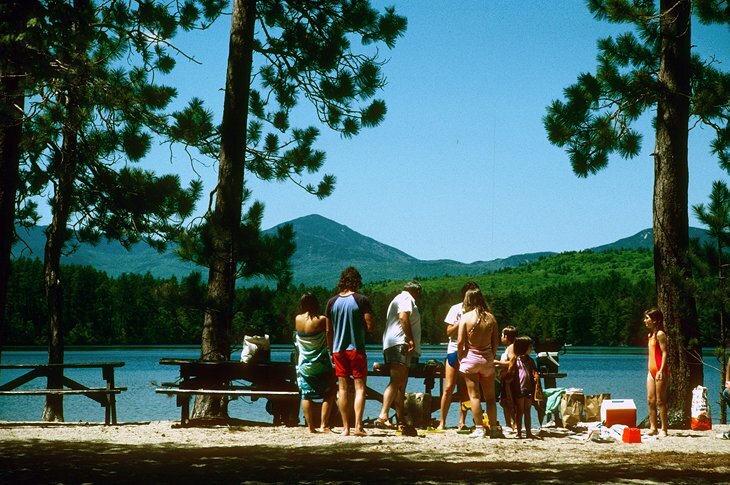 One of the largest campgrounds in the White Mountains, White Lake is also the only one in the White Mountains on a lake with a swimming beach. The 203 campsites are fairly open, under tall pine trees along the shore of White Lake. Many of the sites have lake views. The lake was formed at the close of the Ice Age, when ice was buried beneath glacial debris. As the ice melted, it left a depression that filled with meltwater. You can walk around the lake on a trail to see beaver houses and perhaps spot loons, or you can rent boats at the campground for fishing. Although the beach and a picnic area are also open for day use, the numbers of visitors are limited daily to prevent overcrowding the park. A few larger campsites are reserved for youth groups.